Dr. Coffey wants to keep the editorial team on campus. Former editor-in chief said she is concerned for conflict-of-interest. The university let go of Ashley (Smith) Wiehe, The Huntingtonian’s advisor of three years, earlier this semester and hired Lynette Fager, social media and web coordinator, in her place. This was done with the desire to keep the editorial team on campus, Dr. Ron Coffey, vice president for student development, said. Wiehe graduated from Taylor university in 2005 with degrees in mass communication and journalism. As a student, she served on staff for The Echo, their student-led newspaper. 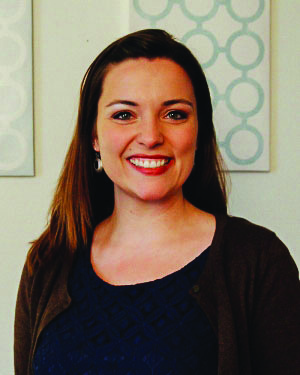 She worked with several editorial-related organizations before joining Huntington University as associate director of media direction in 2010. She resigned from the university during the 2014-2015 school year but continued serving as the newspaper’s advisor from her home in Fort Wayne for the remainder of the year. This year, Coffey replaced her in order to have the advisor be in a full-time position at the university. The Huntingtonian requested Wiehe stay, but the appeal was denied. No one else was considered for the role and the publication board (including the editor-in-chief) was not included in the discussion to replace Wiehe. Wiehe said she wishes the student-led newspaper well. “I look forward to seeing the great work that The Huntingtonian staff will accomplish this year,” she said. Fager is a 2010 alumna of the university, graduating with degrees in journalism, public relations and communication studies. As a student at the university, Fager served on staff for The Huntingtonian. Fager worked as editor of “Business People Magazine” and its family of publications for five years. Fager said she believes The Huntingtonian is a great place for student journalists to learn. Fager said she hopes to help students achieve “ambitious” goals. She said she does not believe her obligation to the university’s public relations will affect her role as advisor for a journalistic organization. Since Fager has taken on her new role, she has requested the login information for all of the newspaper’s online platforms, including the website, Facebook, Twitter and Snapchat. Although it is university policy for University Relations to archive all login information to sites associated with the university, this was never enforced in the past. Fager also requested to review themes and topics for upcoming issues of the paper before their publication to prepare for backlash should the article be controversial. She also asked to sit in on The Huntingtonian’s planning meetings. The Huntingtonian declined, and Fager honored the decision. Jessi (Emmert) Hooley, former editor-in-chief of The Huntingtonian, said she recalled when Wiehe – who worked for the public relations department at the time – was considered for the role as the new advisor. Initially, her staff at the time was concerned hiring her would result in a conflict of interest. The editorial staff wrote a letter to the editorial board expressing their concerns and outlining their expectations, which the board presented to Wiehe after she was appointed advisor. Hooley said Wiehe met with her and assured Hooley she respected The Huntingtonian as a journalistic organization and would keep her roles separate. Coffey said he has no doubt Fager will fairly carry out her duties. Wiehe did a great job at PR and the paper. With that said, I believe Fager has just as much talent and potential. The 2010 paper was probably my favorite to date. I understand the concern but wouldn’t be at all worried about conflict of interest. Can’t wait for more articles! The problem here is that the PR Department is still controlling the Huntingtonian. The Huntingtonian is not necessarily at odds with the PR Department on every article, but conflict is more than just a possibility (see: the breaking story on the Peoria, AZ, campus; the volleyball team’s historic losing streak; criticisms of the campus maintenance; etc.). I was one of the editors (if not the mst vocal — sorry Ashley, nothing personal) that opposed the hiring of Ashley as the Huntingtonian advisor. As Jessi said, this was not because of Ashley, but because of her job. Ashley actually did a great job of managing the conflict by commenting after-the-fact (unless asked). However, conflict-of-interests are not measured by the results, but by the potential. Here the potential harm to the newspaper and the campus (as the beneficiaries of its work) is too great because of possible interference. If Ashley had been notified of the plans to publish the AZ story, she may have alerted her bosses or asked us to delay the story (knowing her, she would not have). It also could stunt the growth of the Huntingtonian staff and writers as journalists. I understand the problem that HU is in — it is a small university, there are few persons within its staff that are qualified for the position, and not everyone in that subset wants the job. But they had a golden opportunity to retain someone that has left the PR department as the advisor, and instead choose to keep the conflict of interest problems. Why? Because they wanted to keep the control. One question remains: Will the name of the paper be changed to The Daily Paff?